I got stuck in Mexico for an extra day! We arrived to the airport to come back to the States on Monday and were told that we were bumped off our flight and that there were no other flights available until Tuesday afternoon. We were a bit nervous with the idea of the shady airline putting us up in a hotel but it ended up being the hotel pictured above. Gorgeous place, great food. We couldn’t stay mad for too long. So now I’m back but buried under the work that I’ve missed. I hope to get back to you all later today but in case not, you can see my pictures from my trip on my Flickr. 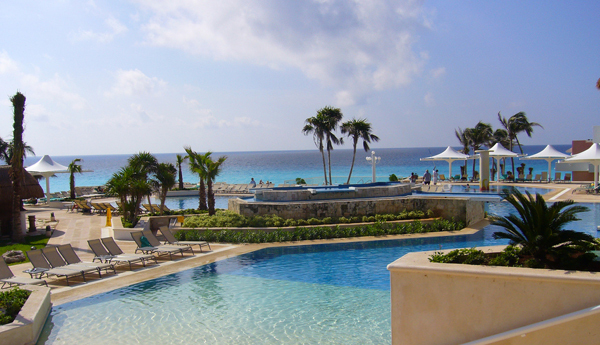 The Omni in CancÃºn. Great food, great staff. We were only there a day and enjoyed it immensely.